Welcome to A Sampling Bee! Today, I share with you body products from Kissing Keepsakes! Madam Body & Sir Body are exclusively on Etsy and they are handmade. They have awesome skin essentials for both men and women. Their products are made from natural ingredients. You will not find any sulfate or paraben in these products. Needless to say, Kissing Keepsake's products are good for your skin! Madam Body's Cucumber & Lime Facial Toner is great for tightening and toning your face and neck. Ingredients- distilled water, ascorbic acid, cucumis, sativust(cucumber) extract, vitamin E and pure essential oil. Kissing Keepsake's products are really nice. 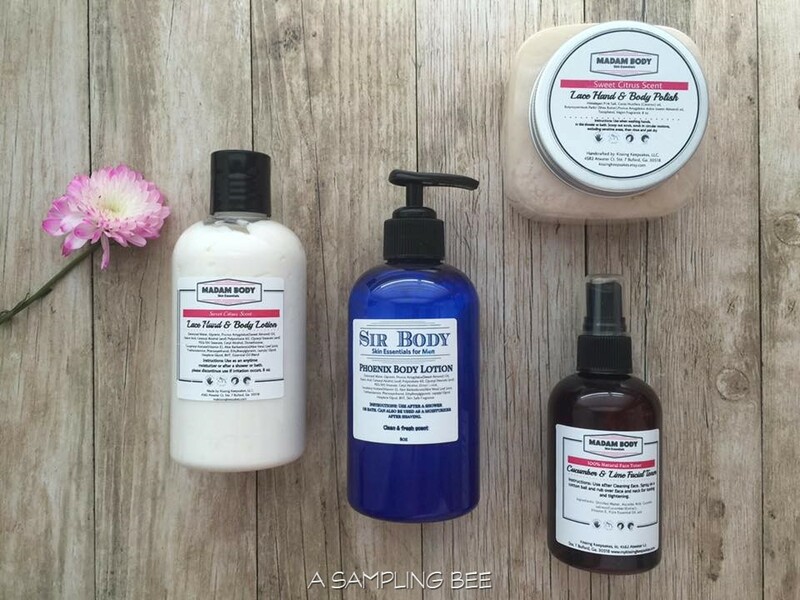 I love how they created awesome smelling products that are great for our skin. I really love the Toner. It smells wonderful and really works to tighten up my face and neck. I also spray it on my thighs and stomach. It's made with 100% natural ingredients, which I love. The Lotion makes my skin soft and smell wonderful as well. After using the Body Scrub, my skin is full of moisture and very fragrant. The Body Scrub is a little bit greasy, but it works well to renew the skin. The Phoenix Body Lotion smells amazing! My husband loves this lotion. It smells like a high end cologne. It leaves the hubs smelling good and it also leaves his skin smooth. I highly recommend all of these products.